Order by Dec 1, 2008 and receive a FREE Pulse Oximeter! The Astra300 puts the sophistication and simplicity of a touch screen in the palm of your hand. Enter data, test patients, and send and print reports with precision and ease. 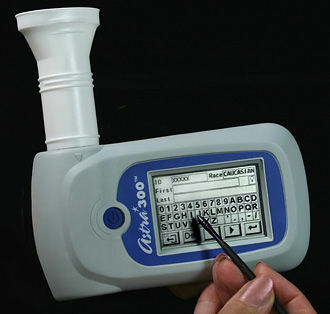 Easily report your choice of up to 40 spirometry test parameters, all measured accurately and precisely. The Touchscreen Makes It Easy.